Masonry support systems, or brick shelves, support brickwork from the main structure. You might not realise they are there, but they have a big impact on the thermal performance of the wall. 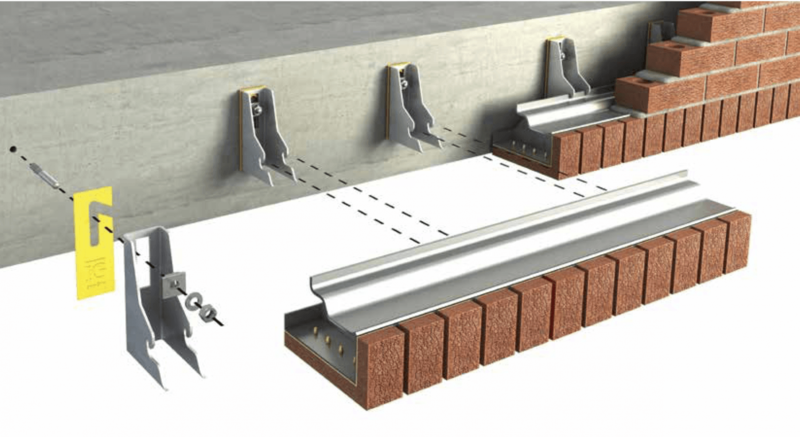 An example masonry support system from Ancon. Note there is no insulation shown. Masonry support is made from stainless steel and the brackets go straight through the wall insulation layer. For a building above three storeys there could be a brick shelf at every storey, or every other storey. And they connect to the main structure via brackets that can be just 400mm apart. For a building we have worked on as part of South Lambeth estate, which is 6 storeys and 30 flats, there will be 547m of brick shelf and 1,367 brackets. The brackets are fairly large and made of a conductive material, but they are also quite a complex shape. Insulating around each one is a time-consuming task that is often carried out badly. You can see why they have a big effect on thermal performance. There is no straightforward input to energy modelling software for brick shelves. This often means thermal performance calculations miss them out, surely adding a more to the building performance canyon. Our approach is to treat them as a repeat thermal bridge and to include them in a corrected U-value calculation. The impact of masonry support systems on the external wall U-value depends on the design, but for South Lambeth they added 38% to the heat loss through some walls. Can you avoid brick shelves? Conventional brick walls above about 12m need steel masonry support. The alternative for a similar finish and better thermal performance is a rainscreen cladding system and brick slips, but this isn’t always desirable. So reducing the amount of stainless steel behind the brick is often the compromise. This reduces cost too. Make sure that brick elements stack vertically, and make room in the façade for movement joints. Support bricks from the foundations. Good practice is for a brick shelf every other floor. Check with the structural engineer why the facade needs quite so much support and ask for suggestions to reduce it. Consider how and what supports the brick above an overhang early in the design. There will be a large steel below the brickwork, and it should not impede on the insulation. Use the maximum thermal break packer behind the brackets. To the best of our knowledge this is 12mm for Ancon systems. Don’t accept 3mm packers. Choose your insulation material. In the gap in the middle of the bracket we favour rigid insulation such as PIR, with mineral wool or another fibre or wool type product around the complex geometry and behind the shelf. Can we make brick shelves better? Pre-insulating the internal profile of the bracket before it gets to site. We hope someone adopts some of these and that masonry supports become less of a hidden thorn in the side of modern masonry construction.